Living in South Eastern Saskatchewan has really opened up the likelihood of us traveling into the U.S.
We're now about an hour and a half from the nearest border crossing, opposed to the five it would take to drive from Saskatoon. We've been into North Dakota a few times, to get some good deals on big ticket items (like the vinyl fence that we put up so Molly could have free reign in the back yard), and to catch flights (to Boston, and Philly). Flying within the U.S. from Minot or Bismark is significantly (we're talking a few hundred dollars) cheaper than flying out of Regina or Winnipeg. 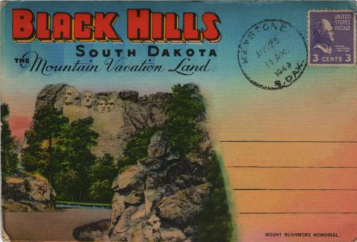 The next road trip I'm itching to take is into the Black Hills of South Dakota. Rapid City has a pretty stellar website, and I plan on ordering state vacation guides from both North and South Dakota next spring so I have all the latest info before taking our trip (fingers crossed for sometime in summer 2013). There are 1,001 places I'd like to go and things I'd like to see. South Dakota may not be be right at the top of my bucket list, but it is likely one I'll knock off the list fairly soon, so that's why I chose to post about it first.